Welcome to The Abso!ute Sound online! We explore music and the reproduction of music in the home. We believe that the sound of music, unamplified, occurring in a real space is a philosophic absolute against which we may judge the performance of devices designed to reproduce music. Our goal is to provide the resources consumers need to judge how a component's sound either honors or departs from the music's truth, and to make sound purchasing decisions that maximize their experience of reproduced sound. Below is our Issue 137, August/September 2002 table of contents and editorial. Editorial Independence: Do Negative Reviews Lead to Canceled Ads? J. Gordon Holt & Pros & Cons of Surround Sound. The Mission: Finding New Enthusiasts. Paul Seydor auditions five budget cartridges. Wayne Garcia discovers high-end magic at a price anyone can afford. Our writers pick the cream of the crop in loudspeakers from $189 to $2,499. What Can We Expect from DVD-A & SACD? Wayne Garcia describes the return of a high-end favorite. B&W's advanced technology trickles down to this $700-per-pair gem. Wayne Garcia reports. If it's 5" around and shiny, this new Pioneer universal machine will play it. Is this the end of the format wars? Shane Buettner looks at one of the first players to handle CD, SACD, DVD-A, and DAD, as well as DVD-Video. Today's mid-priced preamplifier delivers surprising performance, according to Peter Braverman. Neil Gader explores this German high-end company's entry-level amplifier. Shane Buettner auditions the most ambitious DVD-Audio player to date. The top echelon of subwoofer performance, Robert E. Greene decides. Is Isophon's "acoustic hologram technology" for real? Anna Logg investigates. Jonathan Valin explores how close to the music this $35,000 amplifier brings us. HP defines line-stage preamplification, and discusses his five choices for top honors- Hovland HP 100; Edge Signature; Aesthetix Callisto; Wyetech Opal; Conrad-Johnson Anniversary Reference Triode. 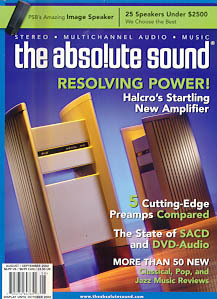 Sue Kraft offers a second opinion on this remarkable amplifier. As popular music fragments into sub-categories, it can be difficult to know what's worth hearing. Bob Gendron reviews ten new albums from independent-minded artists who are creating waves, and helping make 2002 music's best year since 1991. In his career overview of Joe Lovano, Gene Seymour explains why Viva Caruso, Lovano's latest high-concept album, perfectly fits into the saxophonist's growing discography.